Silkie hens want to be moms. That’s just about it for Silkie hens. They live for it. If they aren’t raising chicks, they are brooding eggs or thinking about raising chicks or brooding eggs. I have the feeling that they talk about it amongst themselves when we’re not around. So when my little White Silkie ‘Cloud’ went broody, it was of no surprise to me. Same when my second Silkie hen ‘Snow’ went broody about a week later. It was, however, a bit unusual that they decided to sit on the same clutch of eggs. It was rather amusing to watch two little white hens sitting in the same nest box day after day. They would take turns going out to get something to eat or drink, which is a luxury most broody hens don’t enjoy. So when it became apparent that the eggs they were sitting on were probably not fertile and were never going to hatch, I just couldn’t bring myself to break their little hearts. So I got three little chicks from a neighbor and in the dead of night placed the chicks under the hens and snatched their eggs. You could hear the excitement in their voices and see it in their actions as the two silkie moms discovered the chicks, and took to the task of raising the three little ones. In their zeal to be moms they overlooked the fact that the chicks were already a couple of weeks old and didn’t even remotely look like Silkies (one being an Easter Egger and the other two Barred Plymouth Rocks). The chicks were delighted to have not just one mom but two! They go about the job of raising chicks as though they were only one hen, both teaching the chicks where to find food and water, the joy of finding a fat bug and calling to them when they wander a bit too far away. The chicks snuggle under both hens to keep warm and there is absolutely no conflict amongst them. Cloud and Snow are happier than they ever have been and the chicks love their adopted moms, both of them. I’ve read before that silkies make great moms for hatching all sorts of poultry. But especially other chicks. Thanks for the cute story! This is so cute. I had two silkies hatch eggs together, not their own eggs, some others that I slipped in. It was one big happy family! Humans should be like this. I have to say, that is one of the sweetest things that I have read in a long time. I don’t think that there is anything that can amaze me as much as the love that a mother has 🙂 Thank you for sharing and Blessings! What a wonderful story!! That’s awesome that they both are caring for the baby chicks together. We have two white silkies maybe someday………..
Silkies have the sweetest dispositions. Our two, Blanche and Dorothy think they are lap chickens! They get along so well with our other mixed flock & love helping to raise the new babies. I loved your story. This is just so sweet !!!!!!!! I had a silky that was very broody and didn’t have fertile chicken eggs at the time. But I had turkey eggs!! she didn’t care and was a happy camper. I could not find one of my rose comb black bantam that was sharing two chicks with a Rhode Island Red cross. When I called for her, her head popped out from under the backside of the red hen Sassy. I guess the chicks were under the rosier and Sassy just decided she would sit on top of her. It had to be warm. I also have a “tag team” of two silkies–one white and one black. They hatch and raise chicks belonging to other hens, sharing sitting and babysitting duties. They are beyond sweet! I have an old black silkie hen I was given 2 years ago. I am not sure how old she is, but she has never laid an egg, or gone broody in that time ever. I always thought of her as a grumpy old woman as she always fought with all my other bantams and remained top chicken, but never seemed nice or actually did anything. Just recently she suprised me and went broody for the first time since I’ve had her, so I thought I’d make some use of her and bought some fertile eggs for her to sit on. She sat so diligently on those eggs that she had snail trails across her back! Now we have 6 beautiful little 2 week old chicks and she is such a good Mum and has this new lease on life that I now see her in a whole new light, I won’t think of her as the grumpy old woman anymore! My silkies are sitting on the same nest right now 2!!!!!!!!!!! i think these eggs are fertile and i hope to have a bunch of new babies soon!!!!!!!!!!!!!!!!!!!!!! I only have the one Silkie hen for now (another in the brooder). She went broody and I put 3 Phoenix eggs under her. My son collected the eggs and broke 2 of them, so I put 3 more under. Not only did she hatch out the first baby, she kept sitting for another 2 weeks to hatch the others! I find that at some point the hens decide they no longer want to share the chicks and usually the more dominant hen will drive the other off. There can often be what looks to us like a deathly battle for the right to raise the chicks. It usually lasts a couple days, no one gets seriously hurt and they go about their business as usual with one hen taking on the duties of raising the chicks. There is no danger in letting them brood. Mine tend to stay broody for a month or so, then take a break from it for awhile and go back to being broody again for awhile. It doesn’t seem to have an adverse effect on them, I just don’t get many eggs from them. 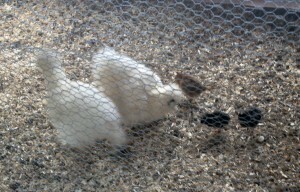 I have 3 silkie hens. Wonderful mothers to 11 baby chicks. When they were setting they would steal eggs from each other. It’s so cute how they roll the eggs underneath with their neck. Now the chicks are 2 months old and when free ranging all the hens take care of all of them. The sweetest thing is the rooster, Kunta. He takes just as much a part. He will find a bug and call them and they come running. When I give treats he will not eat until all the babies and hens are finished. He is constantly keeping everyone together not an easy task with 11 chicks on this acreage! I am so blessed to have silkies. They are so docile and sweet and the best parents! Would love to post video but don’t know how? I have a black Silkie, Olive, that was born in November. She was only 4 months old when I got her, but raised 4 chicks that I put in with her. She was so good to them, gathering them under her wings to keep them warm. I call her Mama Olive! I can’t wait until I can get fertile eggs to put under her. She hasn’t started to lay yet, but I’m sure she’ll be broody as heck when she does. I started with 6 white silkies last year, and was sure that Elvis and Mr Gobblekins were going to be Roos….. until they laid eggs. I also started with 4 (not sure what they are, maybe ‘leghorns’?) white with red combs and red wattles. They were going ‘cheap’ at the local TSC, for just a buck apiece. Now I’m down to 2 silkies and 3 leghorns due to preditors. One of my silkies, ‘Honk’ (she honks like a goose except when broody) has been broody for nearly 2 months. I keep thinking about doing the sneaky chick exchange in the middle of the night – she will even sit on stones if I have taken all the other hens eggs. I keep lifting her off and putting her near food and water. She chuck chuck chuck chuck chucks and puffs up like a big fluff ball, but never hisses or tries to peck at me like I’ve heard about other broody hens. If I were ever to get a Roo, it would be a Silkie.